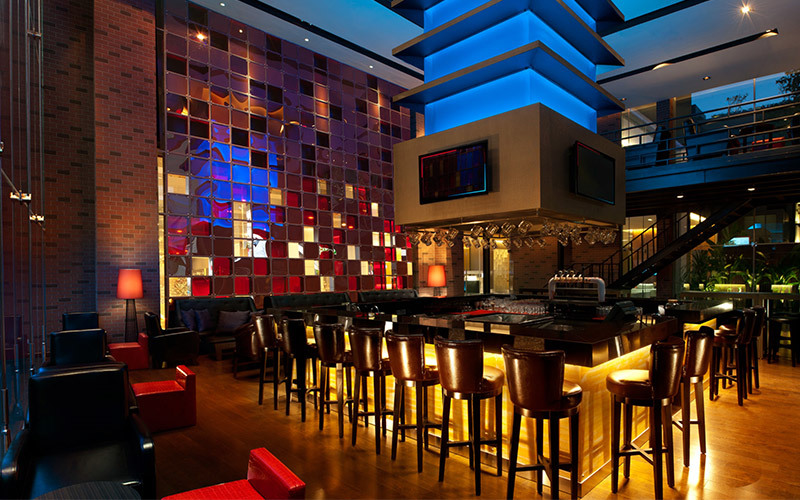 Prominently positioned at the street front of the newly opened ( December 2010) Four Points by Sheraton Bangkok hotel, Beer Vault commands attention to enter and explore the experience of a high quality drinking venue. The bar space is encapsulated in full height floor to ceiling glass panel wall facing onto the street, providing glimpses of the interior from the pavement outside. A small timber terrace between the front glass wall and the street side planter boxes provides some outdoor seating and smoking options for patrons, whilst still maintaining some separation and privacy from the bustling street traffic. The bar interior space is formulated around a square layout – with a large open central bar area, with seating at tables and around all four sides at the bar . The bar is dominated by a spectacular large overhead lighted structure mounted into the high ceiling and which has a “pagoda” style design- and is further highlighted by color changing LED lighting effects. The wall facing onto the hotel driveway is constructed from a colored mosaic of glass blocks that provides both a decorative feature and functional separation from the outside activity. The soaring double height ceiling and the glass wall street frontage creates a feeling of expansive space, yet the atmosphere around the bar is more of an intimate experience. The bar has large LCD panel TVs built into the central “pagoda” structure above the bar- providing multiple options for sports viewing, and there is also a small mezzanine seating area- also with a large screen LCD TV- for more private gatherings. The concept behind the Beer Vault is based on the global Four Points theme of “BEST BREWS”- offering a selection of imported and local beers- draught and bottled. An ice cold beer as an uncomplicated, feel good, refreshing drink. A Simple Pleasure in the spirit of the Four Points by Sheraton brand. Naturally, Beer Vault also offers a full range of other drinks apart from beers- wines by the glass and bottle, spirits and cocktails. Bar snacks and a food menu provide plenty of options to accompany the drinks. And the daily “BEER O’CLOCK” promotion of “buy 1 get 1” on selected beers, wines and cocktails, plus a free selection of tapas dishes and “DIPS & DASH” snacks, is an attractive offer. The service at Beer Vault is first rate, with energetic and engaging staff providing a friendly but efficient service. 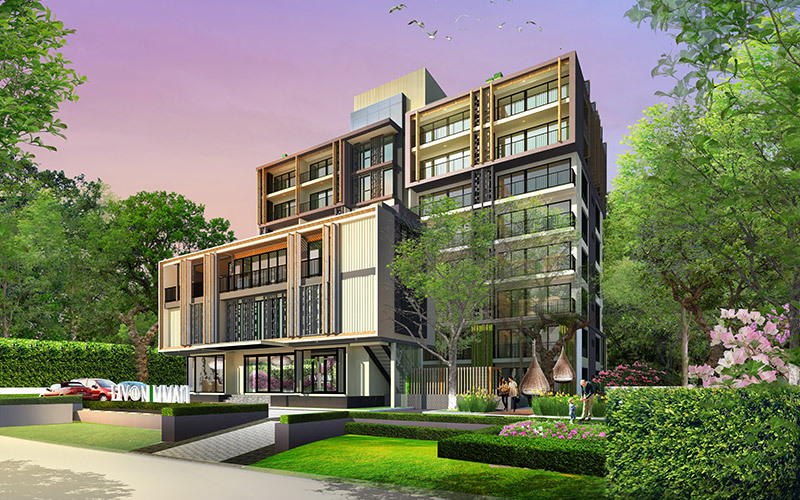 The FourPoints by Sheraton Bangkok at Sukhumvit is the first hotel under this sister brand of Sheraton Hotels to open in Thailand- with several more to open in Bangkok and Phuket later in 2011. The upscale hotels are differentiated from Sheraton Hotels by being a smaller scale in terms of room numbers, and with a modern, uncomplicated approach to both design and service. The hotel is located just inside the soi (street) from the main Sukhumvit Road in the central downtown shopping and entertainment area of Bangkok, and is also easily accessed from the BTS Skytrain- an easy few minutes walk from the ASOKE station.